If you have friends who love a good “smart cozy” mystery, my Edgar Rowdey Cape Cod novels Croaked and Zapped might be exactly the holiday gift you’re looking for. 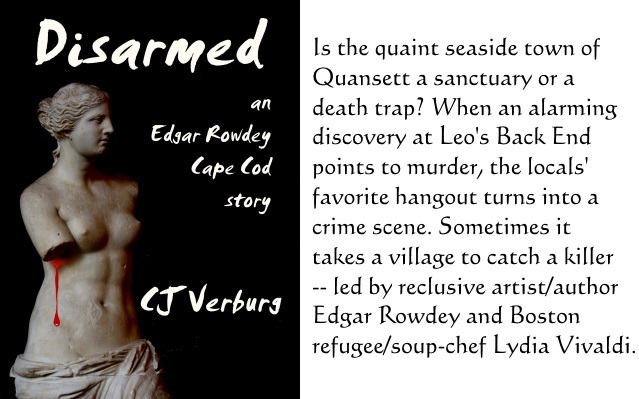 You can find out, or just take a fun crime-solving break, with the free story “Disarmed.” Deliver this Edgar Rowdey Cape Cod mini-adventure to your phone and/or computer with one click on GoogleBooks, iTunes/AppleBooks, Kobo, or Nook/Barnes&Noble. “Disarmed” is also available on Amazon, but they insist on charging 99 cents. Happy Thanksgiving from me and Boom-Books!